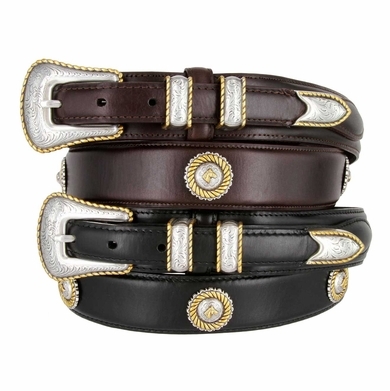 Fine oil-tanned cowhide leather, featuring a sterling silver and gold finish four-piece buckle set and horse-head conchos. Belt is 1 and 3/8" wide, tapering to 3/4" wide at the buckle and tip. Measured from where the leather ends at the buckle to the middle hole at the tip end.